You are an amazing woman with a family and a creative business. You deeply crave success, community and balance. And you deserve to be inspired. You do your work with passion, but secretly wonder if you have what it really takes to succeed. You want to uplevel your business, but you are scared of sacrificing your children in the process. You love your husband and family, but feel like many do not know how to support you. You have so many ideas of what to do next, but you are in a marathon against time itself. that allows you more time and energy for your family and for the simple joys in life. We are Inspired Retreat and we create experiences for women who are growing their business while loving their families. inspiring content and intimate community to refresh your heart, spark momentum and surround you with people who totally get you. experience and are looking to learn strategies to continue to grow your successful business with a thriving family. I struggle to find friends who understand what I do as a creative business owner. I want to learn how to run my business more effectively, so I can create more. I want to discover my core purpose and use it with confidence in my business. I want a learning experience that will give me business tools and wisdom AND help me implement it before I get home. I struggle with work and family life balance. 3am bedtimes happen all too often. I am excited about a cozy and woodsy country inn setting and casual retreat. to get dolled up and be spoiled with beautiful parties followed by pajamas and new friends is nothing short of a dream. believe in you and are cheering you on. learned in your life and in your business. including marketing, sales, social media, finances, etc. of always working in your business. where you can ask all of your questions and get one-on-one support. build your successful business while staying devoted to your amazing family. 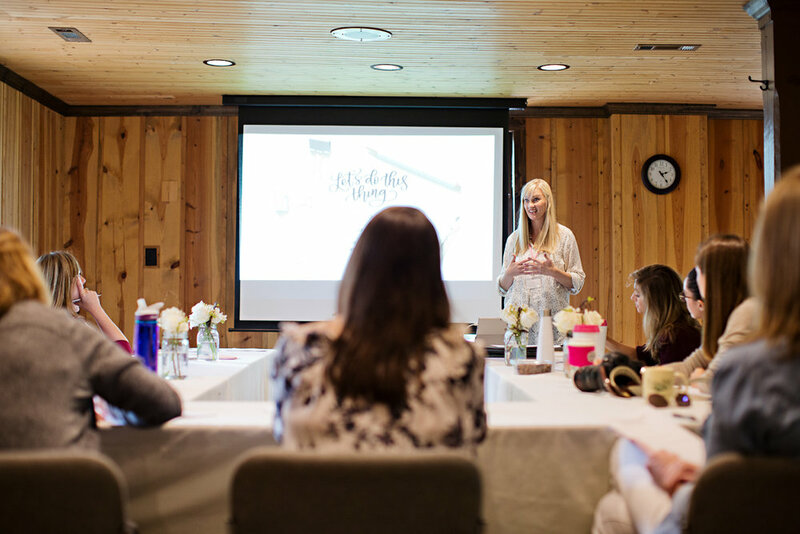 We offer a unique retreat experience for women who are balancing the demands of their creative business, their family, and their own personal fulfillment. With only 24 attendees and 12 speakers in attendance, we highly value connection, celebration and play. We are trading ballrooms, crowds, and pitches for an inviting atmosphere that makes you feel instantly at home. You can expect a group of experienced speakers who are excited to share tools and tips to see your business succeed. You can expect the opportunity to dress up and celebrate. You can expect an intimate atmosphere to not only to learn, but also to make amazing friends. You can expect time take out your laptop and get to work. More than anything, you can be ready for a highly professional retreat full of integrity, details and action that will leave a notable impact on your life and business. The Inn at Evins Mill is home to Inspired Retreat and is a scenic Tennessee resort property located near the town of Smithville which is one hour east of Nashville, Tennessee. Minutes from Center Hill Lake, Evins Mill holds the intimate and charming atmosphere of a country inn. As your sweet home during our time together, you might find yourself chatting with your new friends in rocking chairs on your cabin's front porch while you sip on sweet tea or hearing amazing words from one of our speakers in your pajamas around a roaring stone fireplace in the historic lodge at night. Our group will have exclusive use of the entire property and you can get to know more about the location and all the details of the retreat experience in our free magazine download right here. You are just starting in your business and are discovering who you are and what you do. You don’t yet have the starting experience and knowledge that it takes to run a creative business as you are still learning! Friend, we don’t want you to get lost in all the information we will share, but as you learn, grow and discover, we want to see you and hug you soon at a future Inspired Retreat! This retreat may also not be for you if you have physical limitations. Our host venue property is creekside lodge and includes many opportunities for stairs across the property. We want you to feel at home and at ease in our experience and the last thing we want is for you to feel overwhelmed in moving from each session. As well, if you are very introverted and need lots of quality downtime alone, this may not your perfect retreat, as we will spend lots of time together in groups. You will also be paired with a new friend and roommate(s), so that is something important to keep in mind if your are not comfortable with new situations. You are looking for a business vacation. While Inspired Retreat inherently will leave you refreshed and inspired, our main goal is actively grow and further each our businesses. If you're not serious about the workshop-style implementations and learning opportunities we offer, you will not see results from our experience. A former wedding designer, custom stationery stylist, and cheerleader of creative entrepreneurs, Amber Housley, lives life in a richer way by making every moment and sweet detail count. She founded her creative studio in 2007 which now encompasses her mission to help fabulous, female entrepreneurs get more of their creativity in front of the world. Her wedding and design work has been featured in notable media as Southern Weddings, Southern Living, Bridal Guide, Style Me Pretty and Martha Stewart. With a passion for helping other small businesses succeed, she shares inspiring content, strategic business coaching and community building through her courses, speaking engagement and Inspired Retreat series that has touched the lives of hundreds of women. Raised in southern California and Las Vegas, she and her husband moved to Nashville in 2006 and haven't looked back. With a full­ fledged southern plantation wedding and two sweet little babies to follow, they truly feel like they are living 'the sweet life' each day. Fully embracing southern culture, she also enjoys sharing home entertaining, recipes, decor and gardening how­-to on her lifestyle blog at AmberHousley.com. You can do the work that lights your heart on fire profitably and without sacrificing your family or your personal life.